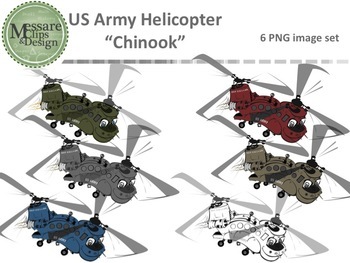 This stylized CH-47 Chinook set comes with 6 high resolution PNG files which includes a black line image for widest flexibility. I am willing to ADD a color variation after you purchase the set if you don't see the color you want. Just email me. All images are in PNG formats so they can easily be layered in your projects and lesson materials. PNG files can easily be turned into JPEG files after purchase if you would like a white background around the images. Click to see the coordinating patriotic frame set! Click to see the matching Military Service Set. Click to see the coordinating happy Army Chinook Helicopters! Click to see the coordinating FREEBIE Patriotic Salute! Click to see the coordinating Patriotic USA MAP.